SanDisk® automotive storage solutions are built to meet the intense reliability, quality and temperature demands of the automotive market. All of our automotive solutions are AEC-Q100 certified. 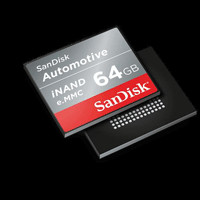 SanDisk works closely with leading automotive chipset vendors to optimize our solutions for the latest application processors, further streamlining the implementation process for auto makers.